Some kids are the Captain America type. They’re ready to lead the team, while maintaining a straight edge. Other kids are more like Iron Man. They want to wear a flashy suit so they can dazzle the masses and rush in to save the day. Some kids are like Thor; mighty, valiant, unyielding! And other kids are like Hulk, a powerful ball of emotion. Then, there are those other kids who are cooking up a sinister plan to conquer the universe. Those kids are a bit more like Thanos. You won’t find those kids leading the team. They don’t want to play hero. They also don’t want to lug around a big hammer. They just want to cause trouble for the heroes with a big golden glove! 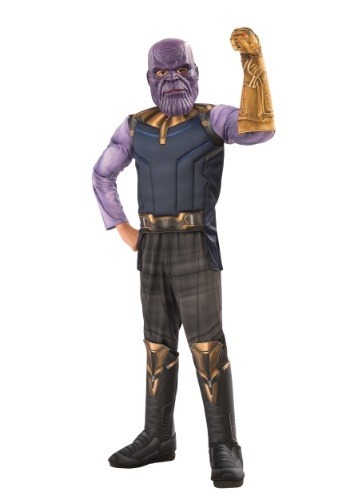 And hey, we think all kids need to live out their dream while they’re young, which is why we love this Marvel Infinity War Thanos costume for kids! This unique costume helps transform any young villain wannabe into the purple bad guy from the latest Avengers film. It comes with a full jumpsuit that has padding in the chest and arms to give your little one a buff and tough look (your child may even feel like having a scuffle with The Hulk). The chest is designed to look like Thanos’ armor, while the arms are the light purple color of his skin. The legs are a dark grey, which end in boot covers that allow your child to wear any pair of shoes with the outfit! Of course, topping it all off is the molded Thanos mask. It gives your child the chilling face of the Marvel villain. So, go ahead! Embrace your child’s desire to be a villain. Who knows! Maybe you can stand at your child’s side as their right-hand man in all the chaos!